We are an English and Blue and Chocolate French Bulldog Breeder Located near Buffalo New York with English Bulldog Puppies and Blue and Chocolate French Bulldog Puppies occasionally for sale. Our English Bulldog sires have come directly from Cody Sickle (bulldog judge) of Cherokee Bulldogs. They are sons of the Top winning and producing bulldogs ever! All our NY English Bulldogs, and Blue and Chocolate French Bulldogs in Buffalo, NY, are home raised and loved. We breed happy, healthy bulldog puppies for you to love and all our bulldogs come with a health guarantee. We raise all our own moms so we know where our kids are coming from. Parents are always here to meet! Our dogs consistently live to be 12 to 14 years old! 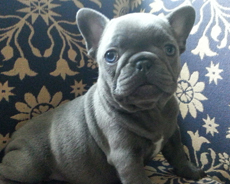 Our Buffalo NY English and Blue and Chocolate French Bulldog puppies have Top American and Imported pedigrees. We breed for health, longevity and temperament. 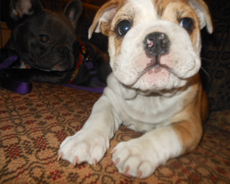 Your Bulldog puppy is home raised in our family room. We care about the quality of our puppies. We breed for the betterment of the breed. Please take a few minutes to look around and find that special Bulldog puppy, Blue or Chocolate Frenchy you’ve been searching for! 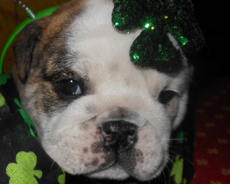 Take a look at some of our recent Bulldog Puppy pictures! We prefer you to come and meet us and visit Niagara Falls.